Scopello is a small medieval hamlet to the west of the island of Sicily, 35km from Palermo. The village offers a truly authentic Sicilian atmosphere with ancient cultural evidence of Moorish, Greek, Roman and even Norman settlements from bygone times. Scopello is centred around its Baglio, the agricultural hub of the original village and now centre piece to an atmospheric courtyard where tables and chairs from the various restaurants and gelatoria are laid out. A variety of artisan shops, a post office, bank and bakery can be found around the cobbled village square or among the few narrow streets, as well as a handful of trattorias and cafes. Below the village is one of the most beautiful coastlines in the whole of Sicily with many small coves etched out of the jagged rocky coastline. You can’t go past a visit to the Tonnara di Scopello, which is one of the most important historic estates in Sicily. The Tonnara was an active tuna fishing factory until the 1980’s and is now possibly one of the only intact pieces of evidence of a traditional Mediterranean tuna fishery. Set in the most striking scenery of rock pinnacles towering from the azure sea, it makes for breath taking scenery and a great place for an ocean dip, snorkel or scuba dive. Further on down the road from Palermo Airport you pass through Castellammare del Golfo which is just a few kilometres from the village of Scopello, this is an attractive seaside town having a Saracen fort and quayside,well worth a visit. From Scopello, the coastal road leads to the entrance to the Nature Reserve of Lo Zingaro, the first dedicated nature reserve in Sicily. Only accessed by foot, you can spend hours walking the trails and enjoying the stark beauty of five miles of coastline, steep cliffs plunging into the turquoise sea and white sandy coves. Most of the villas in our Scopello portfolio enjoy this stunning coastal scenery with have access to secluded beaches as well as private pools. 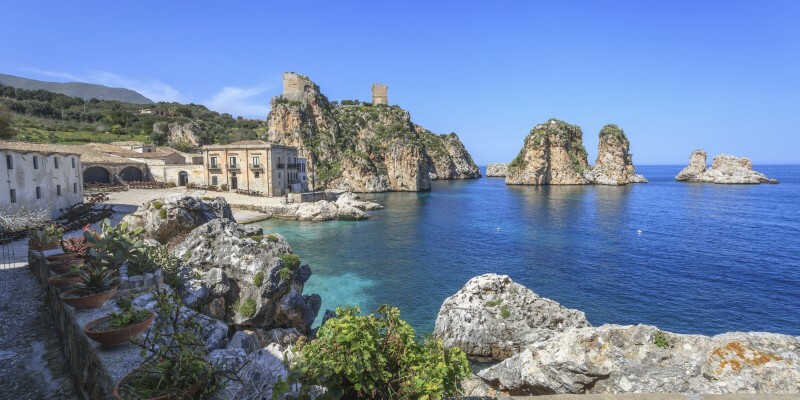 Within an easy drive there is a world of antiquity to be discovered, from the Hellenic temple and amphitheatre of Segesta, to the medieval town of Erice, Trapani and the beautiful Egadi Islands. Not forgetting Marsala, famous for its delicious sweet wine or Selinunte, the most westerly of the Hellenic colonies. In the underwater Nature Reserve of Lo Zingaro you’ll find one of the most spectacular dives in the Mediterranean. 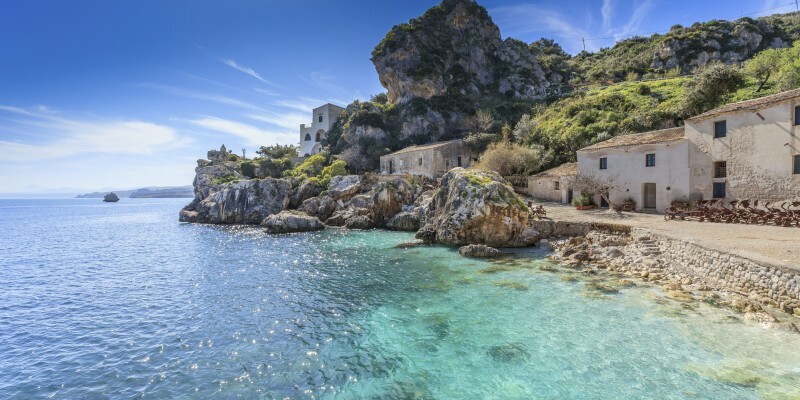 With two wrecks to explore and an abundance of marine life, the Cetaria Dive Centre, based at the Tonnara offers lessons and gear hire for both the novice and expert underwater explorers. These are just some of the beautiful Villa’s, apartments and hotels we have on offer. You can also browse through our accommodation page or call us for any advice… we are experts on Italy!